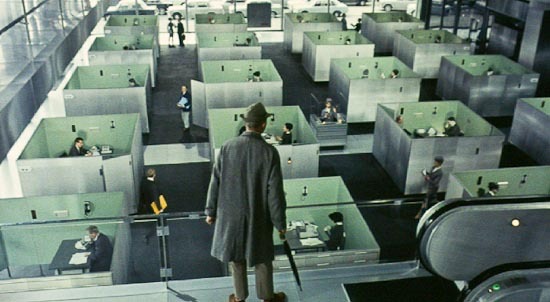 Since its release almost four decades ago, Jacques Tati’s Playtime (1967) has aged like a fine wine. It started life as a critical punching bag and slowly gained recognition as an exquisitely detailed (and very funny) vision of a bland and ultimately bleak modern distopia. Monsieur Hulot gets lost in a modernist maze. 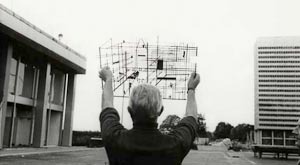 The film presents a bemused vision of life in a Paris built by the International Style of architecture. 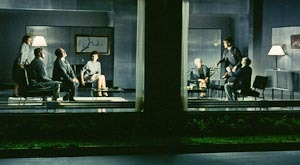 Playtime comprises three main set-pieces, which take place at Orly Airport, an Office Building and a Restaurant. 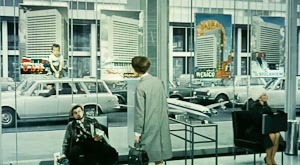 The film was shot primarily on a large modernist set which, it has been suggested, was inspired by the architecture of La Grande Arche de la Défense. 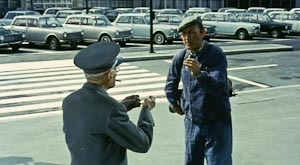 In fact the French press upon the film’s release named the set Tativille, in reference to its megalomaniac scale and the huge expenses that its director Jacques Tati personally incurred as a result. According to IMDB, production of the film took three years, during which 100 construction workers built two buildings using 11,700 square feet of glass, 38,700 square feet of plastic, 31,500 square feet of timber, and 486,000 square feet of concrete. Tati sketches out his creation. And tests it on site. Playtime follows the main character Monsieur Hulot (played by Tati himself) through several elaborately choreographed spatial pitfalls. A very accomplished mime, Tati can be considered the deserving heir to the silent cinema of Charlie Chaplin. However, whereas Chaplin’s Tramp is crafty and often sly, Tati’s Hulot is guileless and benign, and only finds himself causing mishaps by accident or chance. Hulot sort of drifts through the world as a mostly silent observer, and usually reacts to situations in which he unintentionally finds himself. An obvious descendant of the Hulot character is Rowan Atkinson’s Mr. Bean. However, whereas the latter relies much more heavily on outright physical gags with an immediate payoff that focuses on the character himself rather than the broader social context, the former is much more subtle in the timing of the humor, where jokes are meticulously set up, with the punch line often scenes away, and where the running gags, detailed set design and colorful background characters form a very poignant statement about the times, and about man’s relationship with his surroundings – with architecture, commerce, and culture. 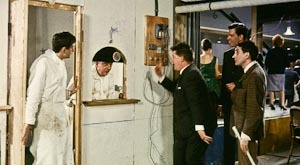 Playtime creates a natural sense of identification between the spectator and Hulot, however because Tati takes a completely detached approach to framing his scenes, the spectator’s point of view moves in and out of sync: at times it is consistent with that of Hulot, so that the spectator falls prey to the same visual errors that he does, and at other times it is allowed to see through a gag so that the spectator can form a more accurate cognitive map of a space than Hulot or the other characters that inhabit it. In his rigorous, almost stubborn use of medium lenses, and in his avoidance of fancy camera effects and motion, Tati crafts what he called a “democratic comedy,” where the director does not punctuate gags with music or other accents in an attempt to instigate laughter, nor does the camera move in such a way as to guide the gaze along a certain path. Instead, the viewer is allowed to “browse” the frame, creating his own patterns and pace. According to Sylvette Baudrot, who was Continuity Supervisor on the film, Tati used mostly a 32 or 35mm lens, which (in the large format he shot in) most closely approximates the human eye. Tati detested close-ups considering them crude and unsubtle, and preferred to guide the viewer’s attention with aural rather than visual cues. In fact, it’s often said that Tati didn’t make sound movies, but silent movies with sound effects. The synchronization of sound and image is one of the unique aspects of cinema as an artform and medium. Whether this is done via live on-location sound recording, dubbing and looping, or sound effects, the intent is to recreate reality by allowing what we see and what we hear to be consistent. However, filmmakers often use techniques that subvert the expected norm. Whether for dramatic, comic, or poetic effect, filmmakers often either allow sound and image to drift out of sync, completely mismatch sound and image (a shot of a baby with the roar of a lion for instance), or match sounds and images in ways that create new meaning. A case in point is a scene which starts with jazz playing on the soundtrack. The music fades down as we hear the sound of sawing coming from some construction workers within a building. We also see through the window five men carrying a large pane of glass. Just then out of the blue, an impromptu street band formed by a couple of bystanders, using only their hands, noses and cheeks, begin trumpeting a rendition of In a Persian Market. The languorous movements of the men trying to maneuver the sheet of glass is thus transformed into an exotic and sensuous dance. It is an audaciously stylistic choice by the director, in which the sounds made by the “band” combine with the melody on the soundtrack into an audio-visual harmony that takes the viewer by surprise with its simple poetry. ... but sectioned off with surfaces. Hulot is visible but unreachable. The ambivalent quality of glass – at once present and invisible, destroying privacy but cutting people off from each other, clearly preoccupied Tati, no less than it obsessed architects of the period. Throughout Playtime, we are made conscious of the presence or absence of glass, its deceptive and misleading nature. 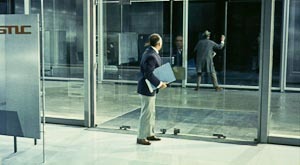 Reflections have a more negative effect when Hulot, hot on the pursuit of company worker Mr. Giffard through an office building, catches a reflection of his prey on a glass pane and is misled into thinking that Giffard is in another building and runs out to catch him, just missing the real Giffard who is in fact pursuing him. 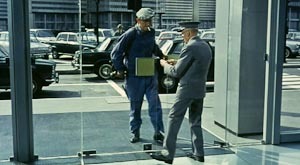 While this visual punnage is highly enjoyable, director Jacques Tati in fact has in Playtime a more intellectual agenda that only fully reveals itself towards the end of the film: Tati grieves the loss of an older, more culturally and historically specific Paris, which has now come to resemble any other city in the world – a jungle of concrete and glass. Tati's Paris is impossible to frame. 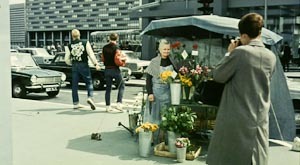 In a scene midway through Playtime, an American tourist comes across an old lady selling flowers out of a tent-like kiosk at the foot of a massive concrete building. “This is the real Paris!” she happily exclaims, but no matter how many times she tries, she fails to capture a photo that does not include modern and foreign Paris in the frame. Tati contrasts the expectations of the tourist with the reality of the city without ever being cynical or bitter. He strikes a timid balance between showing that technology does have its benefits in creating a highly efficient and organized world, but that ironically too much efficiency leads to inefficiency. He seems to be saying that was inevitable that modern cities would acquire their current form because of their high degree of functionality and the convenience of mass-production. Tati’s elaborate visual and spatial gags play on the contrast between materials, the solid opacity of concrete and the reflective transparency of glass, to explore the illusive nature of these artificial surfaces. One reflects another with such intricacy and totality that one is never sure whether one sees the surface itself, its shadow or its reflection. This is an architecture of parallel rectilinear surfaces that intersect and stagger, and around which space flows continuously yet remains striated and demarcated. As shown in Playtime, this architectural minimalism is a two-edged sword: it could be sublime or boring, liberating or frustrating, extremely expansive or totally claustrophobic, technically perfect or infinitely repeatable. Eiffel Tower hides in reflections. ... to reveal a hidden sky. 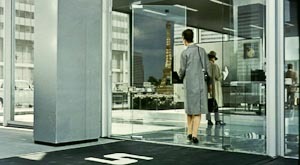 In a later scene from Playtime, the tourist walks into a travel agency and finds that posters advertising trips to several locations around the world all look like the Paris in the film, with its grey modern architecture. The cities are as mass-producible as the posters on which their images are printed. Tati is very aware that the film screen itself is yet another surface. In Playtime, as much occurs at the edges of the screen as does in its center, inviting the viewer to constantly shift the focus of her gaze, so that the screen surface itself is broken down into several zones of activity that give it depth. 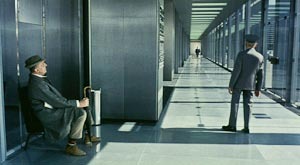 Over the course of the film, his mistrust of the rectilinear surface gradually finds its way to his characters, so that while in the beginning of the film they follow the strict rectilinear contours of these surfaces, by the end they freely roam around the screen in a kind of mass hysteria that negates the systematic architecture around them. People move in straight lines, turn smartly at right angles; the architecture is dictating the way people behave. As the film progresses, curves begin to intrude on the clinical straight lines. People start to reclaim these austere spaces, even to mess them up and break them down, allowing human-shaped spaces to emerge within it. If Playtime has a plot, it’s how the curve comes to reassert itself over the straight line. Tati plays tricks with perspective. Waiter serves champagne or waters the plants. The Emperor makes an appearance. Tati makes a visual pun. Sometimes, these visual effects are used so subtly as to be barely noticeable, such as in the scene where company worker Mr. Giffard walks through a corridor that is made to seem much longer by the fact that the actor is walking in place for most of the shot. 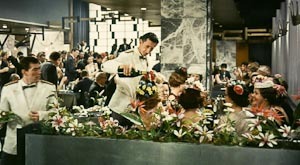 In other instances, visual trickery is used in a way that intentionally draws attention to itself, such as in another scene where a waiter serves Champagne to a group of ladies wearing hats embroidered with flowers. Because Tati uses a medium lens that does not exaggerate perspective, and because we see the scene from behind, it appears as if the waiter is pouring the drink straight into the ladies’ hats, as if he were watering the flowers. 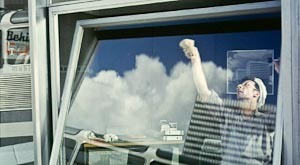 This flattening of perspective is used in yet another scene, where a chef peering out of a countertop window from below a black sliding partition is made to look like Napoleon Bonaparte. One guest even tags a coaster on the partition to make it look like a badge on Napoleon’s hat. These are both examples of techniques that shape and transform space in ways that somewhat negate its original form. This is most powerful when it is done not merely for visual purposes, but for the purpose of revealing the inconsistency or simple irony that is already inherent in almost all spatial experience. Such is the case in another scene in which two apartment blocks are shown side by side. We view the scene from the exterior and can see two families simultaneously through large transparent glass panes, and know that there is a dividing wall between the two residential units. However, as the scene plays along, we “forget” the dividing wall, and it begins to seem as if each family, in fact watching television, is reacting to what is going on next door. It is an ingenious sight gag that not only satirizes the banal uniformity of domestic life, but also the isolated and detached existence that individual families lead in urban apartments, even while the apartments themselves are in very close proximity to one another. 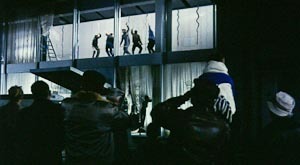 In this scene, even though Tati’s set initially mimics reality (albeit in a somewhat exaggerated manner), as the scene progresses the set functions as a sort of abstract spoof of a particular urban and architectural condition. Playtime is one of the very few films I can recall that not only has a very rich and detailed set design, but in which the characters actively interact with the sets, transform them, and create new architectural spaces with new boundaries right before our eyes. This is especially evident in the final third of the film, which almost completely takes place in a pretentious upscale Parisian restaurant called the Royal Garden. 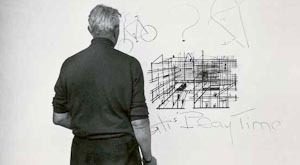 The sequence is the coup de grace of Tati’s loving criticism of architectural dogmatism, the first half of which was set in an a glass and steel office building in which employees were boxed-in by compact and highly efficient working cubicles. 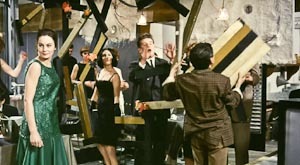 On the other hand, this final sequence is set in a restaurant during opening night, while the builders are still making the final touches to the finishing even as the guests begin to arrive. The first mishap is a harbinger of the disasters to come, as a loose tile gets stuck to the shoe of the maitre d’. As the restaurant fills up, the staff struggle to keep up with the rising chaos of misplaced orders, guests changing tables and seasoning the same fish at least three times. Things really come to a head when Hulot (who else?) accidentally pulls down a portion of false ceiling and the wooden paneling comes crashing down, forming a partition between an ad hoc niche space and the rest of the restaurant. 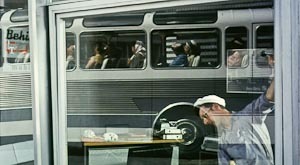 Ironically, the sequence for all its noisy revolutionary loudness and irreverence ends with a shot of a drunk young man, a single solitary figure, standing in the open air against the looming silhouette of a large glass and steel building, as a rooster crows and a loud sigh is emitted by the crowd from inside the restaurant. It is hard to know what to make of this sudden, almost surreal shot. My interpretation is that the building, which is a fallback to the locations of the first half of the film, reminds us that the scene in the restaurant, where everyone let loose in the spirit of the old Paris, was but a brief interlude in this modern world, a discreet affair in the night, ended by the coming of dawn and the crowing of the rooster. However, the following scenes that led up to the end of the film continue in the same warm ambiance started by the impromptu bistro. A drugstore that was initially shown as a cold, inhospitable, green-lit space now bustles with a lively crowd. These scenes would be very hopeful were they not drenched in a dream-like quality that compresses time such that dawn is soon followed by dusk. Instead, these closing scenes take on a feeling of melancholy and nostalgia, of a certain wishful thinking on the part of Tati, somehow as if he is reluctant, despite everything, to go back to showing daytime Paris in the same way he did during the first half of the film. Here the director takes artistic license (one is tempted to say, even plays architect). He ends the film not with the hyper-real Paris of the present, but with the whimsical Paris of his memory, and to the sweet melody of an accordion. 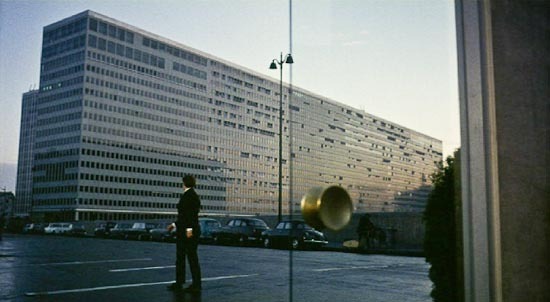 I don’t understand the reference to the Grand Arc la Defense – as you know it probably very well it was built a good fifteen years later than Tati’s film was made. De nuevo, murallas por doquier. Clash of Clajs no lo han puesto en práctica. Admiring the dedication you put into your blog and deetalid information you offer. It’s awesome to come across a blog every once in a while that isn’t the same old rehashed material. Excellent read! I’ve saved your site and I’m including your RSS feeds to my Google account.